Anytime a Pennsylvanian hears that the temperatures are going to hit the '70s in November, it's time to take action because who knows? It may be the last hurrah before we're plunged into a deep freeze for five or six months. This past weekend, we decided to "make hay while the sun shines," by taking a short trip out of town to see a few new sights. After some deliberation, we decided to make it a short trip and visit the town of my birth--historic Bellefonte, Pa. Although we're very familiar with State College, located just 13 miles away, we never spent time exploring the Bellefonte area. It took us about an hour and a half before we arrived in town and thanks to Foursquare, we chose lunch at The Governor's Pub. Parking nearby was cheap--with just a few quarters needed for the meters. Although the outside didn't look like much, the inside was cute, service was prompt and friendly and the food was good too. We split a Reuben and fries. 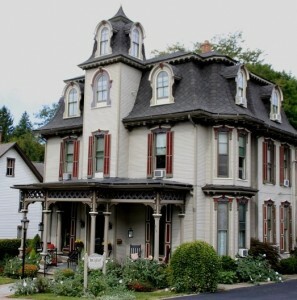 Because Bellefonte is known for it's B&Bs, as well as its Victorian architecture, we decided to enjoy both by staying at The Queen, located on Linn Street. The Queen is beautifully decorated and is typical of many of the elegant Victorian structures that you'll see during a drive around town. 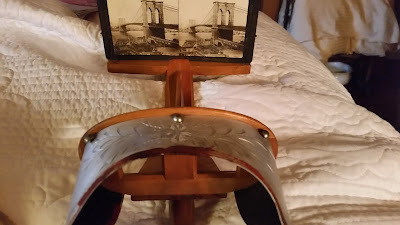 Owner Nancy Noll greeted us, showed us the Victorian parlor that we'd have to ourselves that weekend, entertained us with a few notes on the player piano, pointed out an old-fashioned Victrola and demonstrated a stereoptic viewer (a precursor to the View-Master). Later on that evening, I grabbed the collection of about 100 slides and took them up to the room for further inspection. Accommodations at The Queen were spacious and comfortable, with a sofa, a flat-screen TV, a small bathroom and a "slipper tub" separated from the bed by a screen, which might not be for everyone, but we knew about it beforehand. A writing desk overlooked the street and an extremely comfortable bed offered a wonderful night's slumber. We took time to drive around town and were amazed at the many beautiful Victorian mansions that have been seemingly well tended throughout the years. 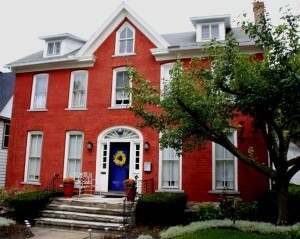 Several operate as B&Bs, but most are private homes. The Bellefonte area has a very low unemployment rate with top employers being the federal government, the Bellefonte School District, the state government and Geisinger Health System, so it stands to reason that the residents have been able to keep the huge Victorian mansions in such beautiful condition. During our trip, we paid a visit to the Centre County Library and Historical Museum located in the 1814 Miles-Hume house. matches and cigarette lighters.) We also viewed a model of the statues that stand in front of the Pennsylvania State Capitol made by sculptor George Gray Barnard, who was born in Bellefonte. A model of George Gray Bernard's work which can be seen at the entrance of the Pennsylvania State Capitol. After touring the museum, we stopped in at Big Spring Spirits, a relatively new distillery housed in the old match factory mentioned earlier. There guests can choose from among a variety of hand-crafted spirits like gin, whiskies and rum. One of the owners is an interior designer and it shows. 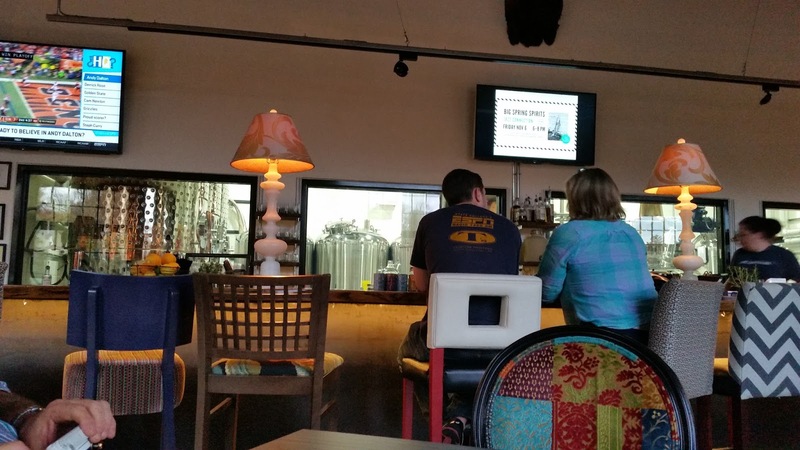 The spacious and inviting "tasting" room is more like a restaurant and the over-sized, comfortable chairs and tables are conducive to relaxing and enjoying an evening with good food and friends. 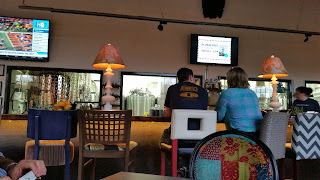 A glass wall behind the bar gives patrons a sneak peak into the nuts and bolts of the distilling operation. Before heading to State College for "First Friday," on that same evening, we took a few pictures of the attractive Talleyrand Park and visited the American Philatelic Center,where we viewed a few small exhibits. In the next few weeks, Bellefonte will be hosting its 34th annual Victorian Christmas. Learn more here in this article at Flipsidepa.com.